A new cookbook promises to reduce not the volume of your post-prandial gas attacks (that’s what Beano is for—and we already have a case of it delivered weekly to FirstNerve Manor), but the offensiveness of the odor. 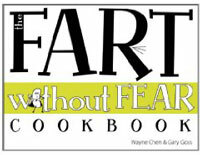 Elena Ferretti gives an enthusiastic review to Fart Without Fear: Comfort Food for Uncomfortable Times, by Wayne Chen and Gary Goss. The authors claim that foods rich in the sulfur containing amino acids methionine and cystine yield the stinkiest farts; think chicken fried steak (open the window!) or turkey club sandwiches (run for the hills!). Their solution is to offer modified versions of traditional recipes that will render your emissions less toxic. Sounds like the perfect gift for everyone in your carpool. Order The Fart Without Fear Cookbook through the Amazon link in this post and you’ll help keep us in Beano at no cost to yourself. As Jacques Pepin would say, happy eating!